You probably have cameras you want to upgrade, but it’s too complicated and expensive. Today’s technology has changed and now there’s a better way to upgrade. CheckVideo brings the power of the cloud to combine all your different cameras and recorders into a single view. Just like Youtube™, all you need is a mobile device and web browser. Watch this video to see CheckVideo display multiple camera feeds from multiple locations, all on one screen with just a few clicks, using just a web browser. No wonder The Security Industry Association gave CheckVideo the New Product Showcase Award and Security Products Magazine awarded CheckVideo the New Product of the Year Award. Best part is, CheckVideo works with your existing cameras. 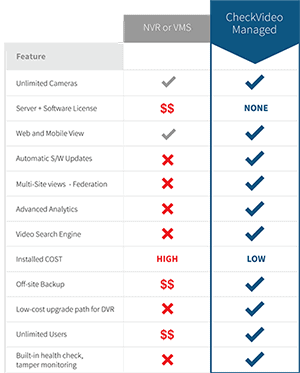 CheckVideo empowers you to use the full potential of your cameras.